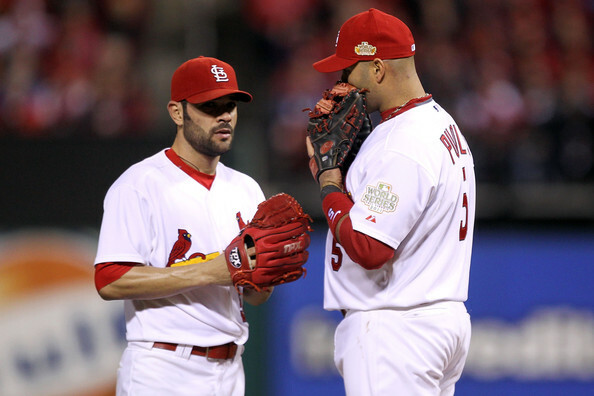 Garcia was shaky in the second inning as well, as a walk and two hits allowed the Rangers to tie the game at 2. 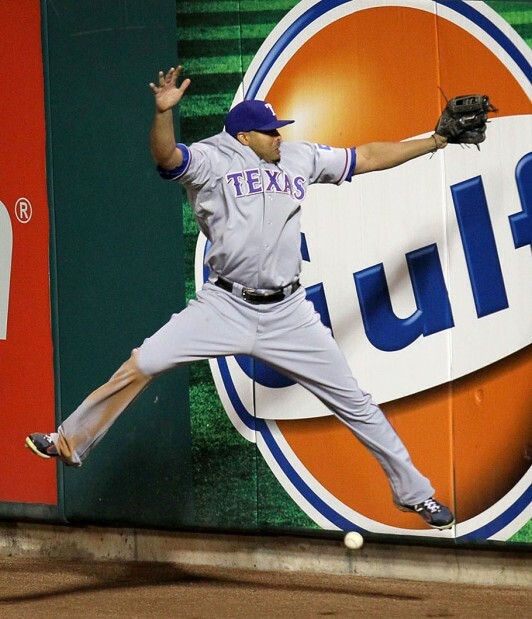 In the top of the fourth, with Fernando Salas now pitching, there was the unfortunately memorable play above on a fly ball by Nelson Cruz and he ended up at second base. The next batter, Mike Napoli, singled him home to put the Rangers up 3-2. 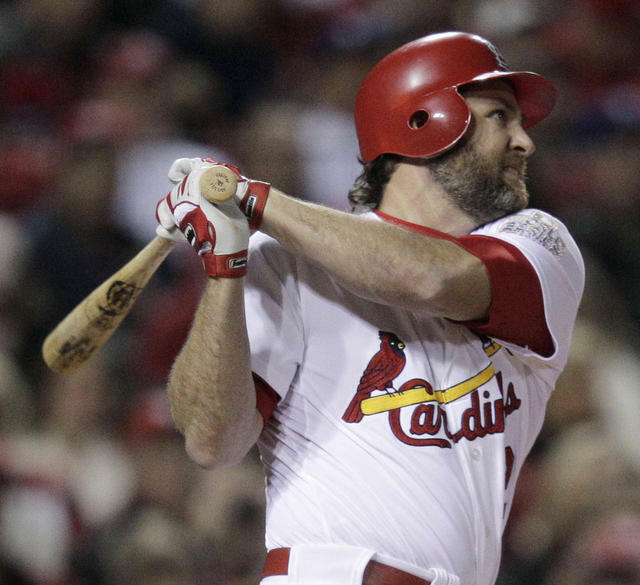 The Cardinals tied it in the bottom of the fourth as Lance Berkman reached on an error by Michael Young and ultimately scored on a Yadier Molina groundout. 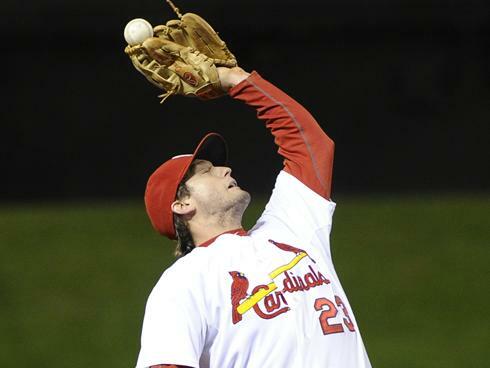 Next inning, the third most-memorable thing David Freese did during the game allowed Josh Hamilton to reach. 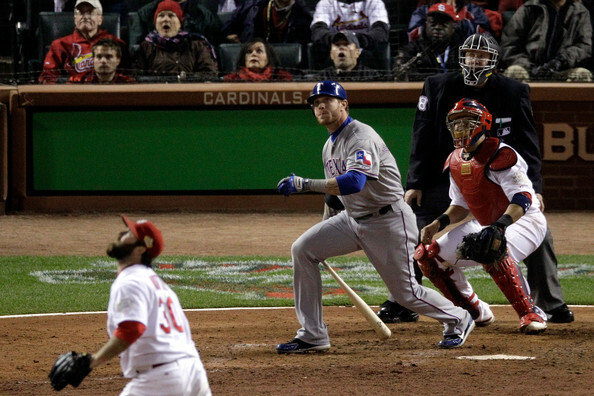 He then scored on a double by Young, 4-3 Rangers. 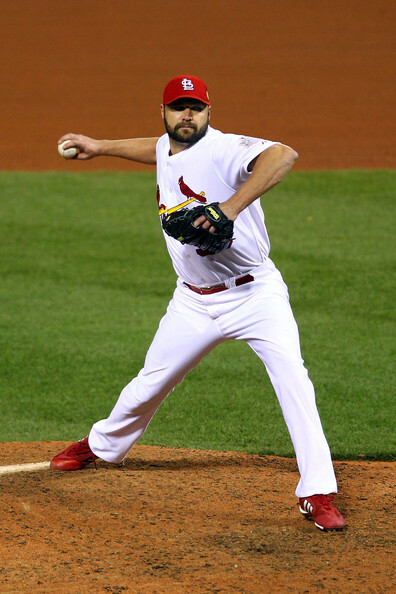 Lance Lynn took over in the sixth and had an uneventful inning. 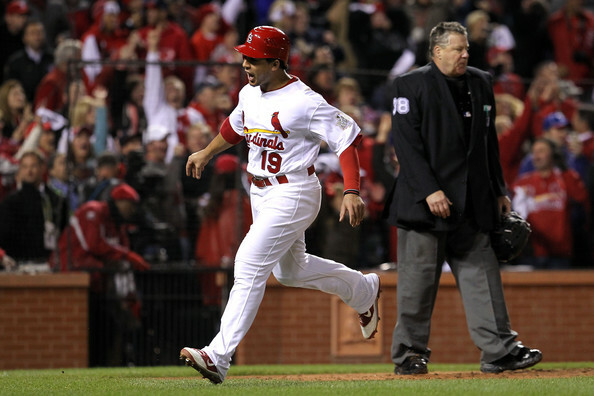 In the top of the seventh, though, he gave up back-to-back home runs to Adrian Beltre and Nelson Cruz. Later in the inning, with Octavio Dotel taking Lynn’s place, the Rangers scored again on an Ian Kinsler single to make is 7-4. 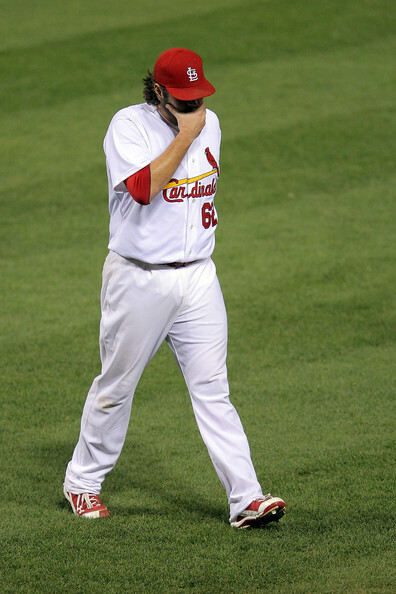 In the bottom of the eighth, Allen Craig — who replaced Matt Holliday in left — homered to make it 7-5. 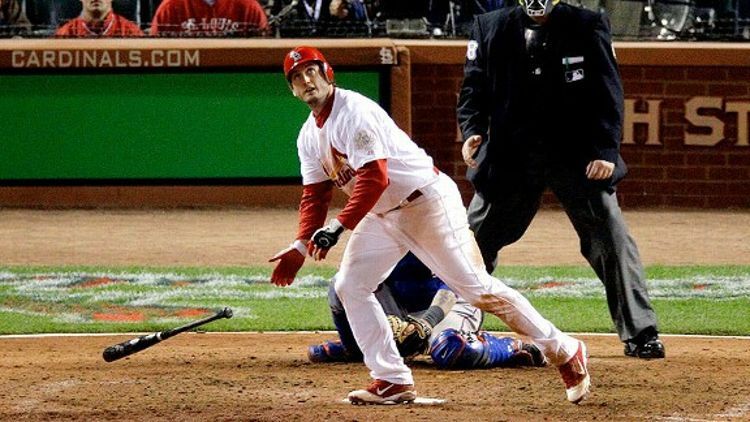 Ryan Theriot was up. 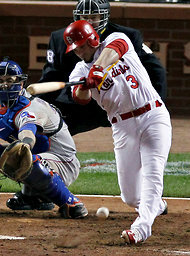 In one of the rare positives of his year-long Cardinals career, he drove in Descalso on an infield groundout. Yes, the photo is small at full-size — but at least it exists. On to the top of the 11th, tied 9-9. Jake Westbrook allowed a one-out single, but that was all. Then, to the bottom of the 11th. 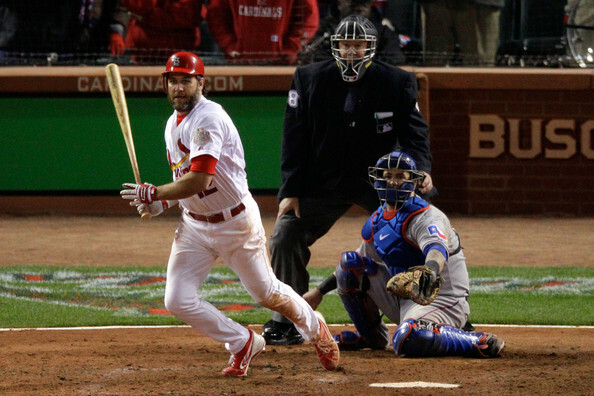 Then it was on to Game 7. 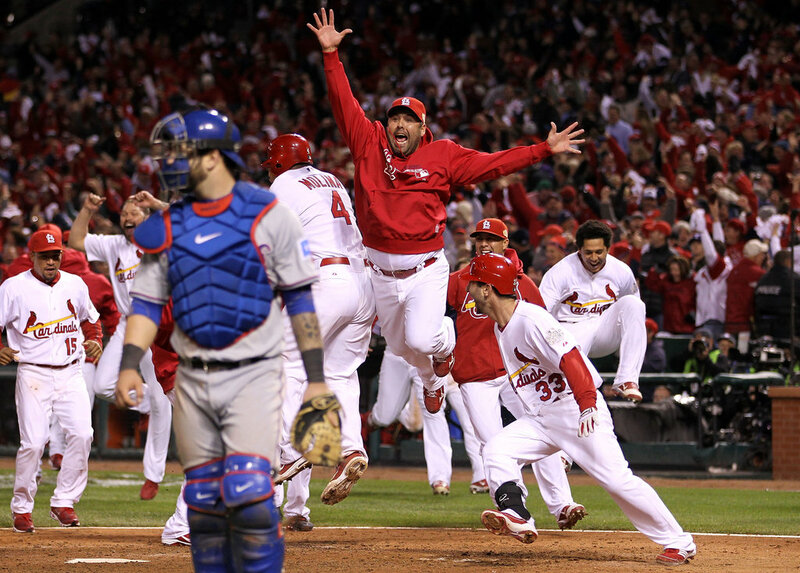 This entry was posted in 2011 Season and tagged 2011 World Series, Five years ago today ..., Game 6 by Christine Coleman. Bookmark the permalink. Now this is a wonderful Throwback Thursday. Great, great memories. 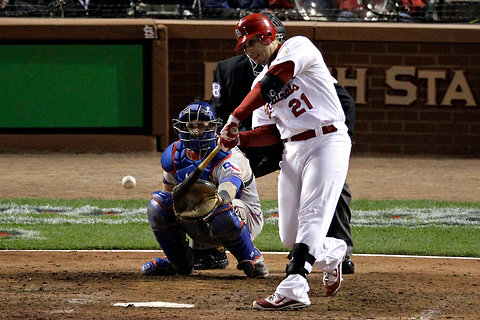 You always hear people talk about the most significant home runs of all time – and I certainly think the Freese home run enters into that discussion. But no one ever talks about the most significant triple of all time. 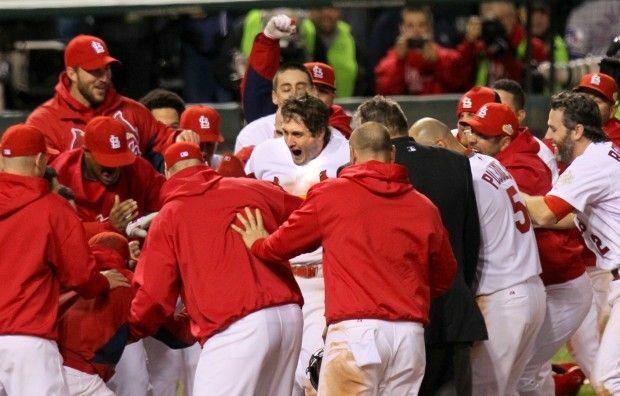 While there have been many, many dramatic, iconic home runs hit throughout baseball history, I submit that David Freese’s ninth-inning triple stands virtually alone as the most significant triple in baseball history. This was a game and a season for the ages. Thanks for the look back.